Lwsengme Fitbit Blaze Bands for Men Women, Stainless Steel Bands With Rhinestone & Metal Fitbit Blaze Frame, Watch Accessory Bracelet for Fitbit Blaze by Lwsengme at Kode Fu Guru. MPN: LWB001. Hurry! Limited time offer. Offer valid only while supplies last. ♣Our bracelet fits fitbit blaze and fits wrist size about 5"-7.8"; A free stainless steel watch frame is included, it will protect the corner and sides of your watch face, durable and comfortable, excellent value for great price. 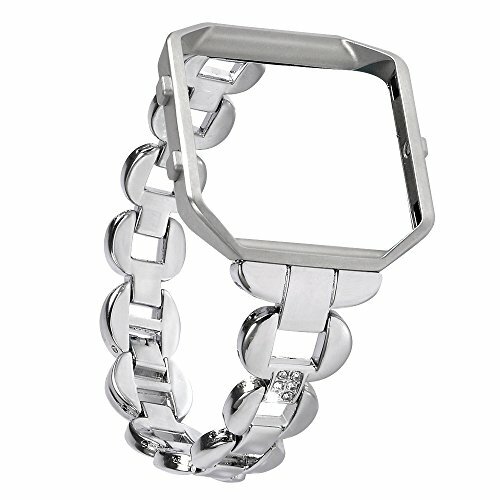 ♣It is elegant-designed with rhinestones and sophisticated workmanship on each side of the bracelet for a very stylish, classy, delicate and feminine looking which is a stunning and remarkable design for women when wear your fitbit blaze. ♣Different color bands give you more choices to dress up your watch fitness and outfits on many occasions. Furthermore, it is also a exquisite and perfect GIFT for women, men on Mother's Day, Father's Day, Birthday, Thanksgiving Day, Christmas and so on. ♣Fun DIY Watch Band - A adjustable tool is enclosed for free. You could enjoy the process of removing or installing the links if you want DIY. The detailed steps and video on how to adjust the watchband is in the Product Description. If you are not sure how to adjust the watch band well, we recommend you to go to jewelry stores. ♣Package - Including 1* watchband + 1* adjustable tool (Enjoy Fun of DIY Your Watch Band). Warranty: The 1-year quality after-sales guarantee is provided. If you have any questions, please feel free to contact us, we will reply you asap.